Operators: Maksimov L., Akkuratov E., Bajkov V., Buslaev Yu., Voinov O., Volkov V., Voroncov S., Golubev Yu., Golovnya V., Dobronickij V., Ivlev Yu., Izvekov V., Kolobrodov A., Kuznecov I., Kuzminskij S., Kuslya Ya., Lovkov V., Mikosha V., Myakishev G., Usanov V., Fedyaev E., Filatov I. 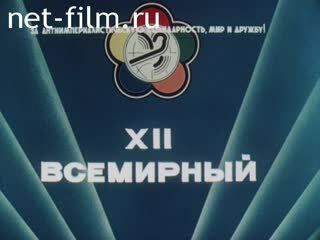 The film is held in Moscow XII World Festival of Youth and Students. Day One - Hello, Festival! Day Two - Star March. Day Three - accuses the youth of the world. Day Four - Children of different nations. Day Five - Holiday ends. Day Six - The main human right. Day Seven - Addresses friendship. Day Eight - Until next time! Towards the chamber is a girl dressed as the mascot of the festival "Katyusha" a traditional Russian round loaf in his hands. Day One - Hello, Festival! Luzhniki Grand Sports Arena, in the view of the stadium named after Lenin. Spectators in the stands applauding, waving artificial flowers, flags and scarves. The opening ceremony of the festival. Live panel on the main arena and the stadium. Alternation: columns of the festival, stands welcome foreign guests. Raise the flag over the stadium festival. On the stadium broadcast let the motorcade with the torch festival. The motorcade in the streets of Moscow. Motorcade in the arena of the stadium. In an open car and are P.Ratnikov G.Yu. Gagarina with a torch in his hand. The car stops, and P.Ratnikov G.Yu. Gagarina go out and climb the stairs. Gagarina on the lift and on the background of the living mural. Alternation: spectators in the stands, Mikhail Gorbachev made a speech. Gagarin GY - Economist, Doctor of Economics, professor, daughter of cosmonaut Yuri Gagarin Mikhail Gorbachev - State, political and public figure, the last general secretary of the CPSU Central Committee, the last President of the Presidium of the Supreme Soviet of the USSR, the first chairman of the Supreme Soviet of the USSR, the only president of the USSR. Solid big festival torch alive panels. Alternation: applause, performances by dance ensembles Soviet republics. The operator with the camera. The procession of the parade. Alternation: applause, vibrant murals, the stadium let out pigeons. Day Two - Star March. Foreign guests of the festival are a garland of flowers at the Tomb of the Unknown Soldier in the Alexander Garden. Laying flowers at the Eternal Flame. The emblem of the festival. Road stretching with the emblem of the festival. Poklonnaya Hill, the construction of a war memorial. Foreign delegates and guests of the festival take part in the construction work. Meeting with veterans of the Great Patriotic War. Alternation: Star march on the streets of Moscow, the capital's residents welcomed the marchers. Panorama of the stadium "Dynamo". The alternation of fragments of the pageant, the audience in the stands. Veteran of the Great Patriotic War. Participants representations with portraits of the heroes of the battles. Fragments of the youth meetings in thematic centers. Statue of Hermes near the World Trade Center (Sovincenter, Hammerovsky center). A fragment of an interview with representatives of Cuba. People in and around the topic centers. Day Three - accuses the youth of the world. People talk in the hotel lobby. Meeting of the International anti-imperialist tribunal. Stand with pictures of victims of the bombing of Hiroshima. Says one of the survivors of Hiroshima. Photo child in a broken frame. Alternation: he said a delegate from Lebanon, chronicles military conflicts (dead and wounded, a protest rally). A fragment of an interview with a young woman. He tells the delegate of Afghanistan. Hall International anti-imperialist Tribunal welcomes the Salvadoran guerrillas. Fragments of the meeting, participants act on the tribune. He tells fighter from Nicaragua. Says a resident of South Africa. On the podium of the delegation of the United States. Anti-war rallies in the days of the festival, people with banners, slogans and balloons. Day Four - Children of different nations. People at the stand with the schedule, "Diary of the festival". View of one of the buildings of the University of Friendship of Peoples. Participants of the "Free Tribune" on the steps of the university. Meeting of the delegations of the USSR and the USA. The building is Vetoshny alley. The employees of the press center of the festival for typewriters. An interview with a journalist from Angola. Journalists working on the preparation of materials. Hotel "Sport", people go out into the street. People communicate outside the hotel. People sit in the bus. The views from the windows. Sightseeing buses on the streets of Moscow. People buy souvenirs at the Bazaar Solidarity. On stage musical ensembles perform in the hall dancing youth. Day Five - Holiday ends. 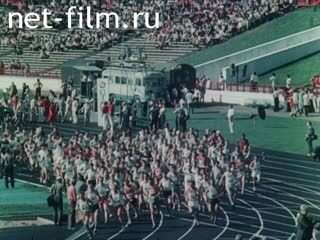 The international race of the world starts at the Luzhniki Stadium. Runners on the streets of the capital. International chess tournament with A.E.Karpova and other grandmasters. Friendly football match at the stadium "Torpedo" with the participation of teams of Moscow and guests of the festival team. On the podium L.I.Yashin. L.I.Yashin congratulates participants. Fragment of theater performances on the ice. Performance of dance groups in the Park of the Arts. People are watching the work of the potter. Works of artists in the creative workshop. A man posing with a guitar artist. The artist paints a portrait. T.T.Salahov at work. H.Bidstrup draws on the poster of the festival. The emblem of the festival over the entrance to the park. Moscow Book House on Arbat. M.Legran and Zh. Brezhak in an open car. The alternation of fragments of an interview with the composer and poet, the streets of Moscow. Rows of buses in the parking lot. Festival of Folk Art in Kolomenskoye. Performing music and dance groups from around the world. Part of the audience is learning folk dances. Day Six - The main human right. Detail of a rally of solidarity with Vietnam. JA Samaranch and Salizaks - Spanish sports figure, chairman of the International Olympic Committee, the first vice president of the International Federation of Modern Pentathlon. AE Karpov - A chess champion, international grandmaster, Merited Master of Sports of the USSR. LI Yashin - Soccer goalie, Honored Master of Sports, champion of the USSR and Europe, the Olympic champion. Salah TT - Soviet, Russian and Azerbaijani painter, teacher, professor, vice-president of the Russian Academy of Arts. Legrand MZ - French composer, pianist, arranger, conductor, singer of Armenian origin. H. Bidstrup - Danish cartoonist and social activist. Women's Rights Center of youth. Women come to the house. On the podium with a Vietnamese citizen translator. Those participants in the meeting. Center for the rights of migrant youth. He tells the delegate from Germany. General view of the room. Conference on Human Rights devoted to the 10th anniversary of the Helsinki and the signing of the Helsinki Final Act. On the podium, the delegate from France. The audience in the hall. Says a delegate from Finland. Says 1st Secretary of the Moscow city committee of the Komsomol Smirnov. Vehicle traffic on the streets of Moscow. The symbolism of the festival. Palace of Pioneers in the Lenin Hills, the meeting participants of the festival with their children. Children learn to walk on stilts. Children's ensemble plays on wooden spoons and the game teaches adults. The concert at the stadium: a joint performance of children's dance groups and S.M.Rotaru. Children draw with chalk on the pavement. Day Seven - Addresses friendship. Pleasure boats on the river. Those passengers, with water views of Moscow. Guests of the festival on Red Square. People write in a notebook. Club of the Soviet delegation at the Plaza of the Commune. Girls dressed as the mascot of the festival "Katyusha" welcome guests with bread and salt. Guests and spectators with flowers. Says the girl-mechanic from Kazakhstan. The meeting with the delegates of the festival S.E.Savitskoy. Rotaru SM - Pop singer, actress, People's Artist of the USSR. Karapetyan Sh.V. - Soviet athlete in the discipline diving record holder and champion of the USSR, Europe and the world, Honored Master of Sports, Honorary President of the Russian Association of diving. Savitskaya SE - Cosmonaut, Air Force Major, Honored Master of Sports of the USSR, Hero of the Soviet Union. A visit to the village of New Podosinki. Excursion to the car factory "ZIL". Day Eight - Until next time! View of the sports complex "Luzhniki". People exchanged addresses, say goodbye to each other. Dancing, singing and processions through the city streets. A fragment of an interview with a foreign guest. Alternation: spectators with flags in the stands, the hostess of the festival give flowers heads the Central Committee and Politburo members. The representative of Nicaragua K.K.Kruz. Alternation: K.K.Kruz read the final document of appeal to the World Youth Festival, face the audience, pan stands. Alternation: V.M.Mishin acts, burning a big festival torch stadium panorama, face the audience. Secretary-Coordinator of the Permanent Commission of the International Preparatory Committee Jean-K.Kenedi thanks the organizers of the festival. Alternation: clap podium flag festival. The lights in the audience ranks. Speech by the artists of the Bolshoi Theater, the fragments of the ballet of Tchaikovsky "Swan Lake." The final parade on the festival's closing ceremony. Mishin VM - State and public figure, 1st secretary of the Komsomol. Dance Suite "Russian souvenir" in the combined performance of professional and amateur dance groups, live mural. The spectators in the stands. It sounds farewell song festival performer in the spotlight, around the stadium lit sparklers. Members and guests of the festival dance at the stadium.